Proocam Pro-F089 Snap-on filter offers perfect color correction in Blue and Tropical Water. 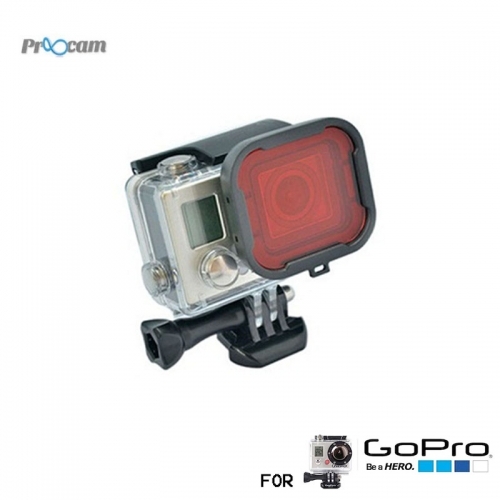 The filter quickly and securely snaps onto the GoPro Hero3 Housing. The filter should be used between 12 and 75 feet deep. Polar Pro has logged over 100 dives testing the perfect color red for the GoPro Hero3 and this formula is the best yet. From the Caribbean to Hawaii to the Philippines, this red filter will produce vibrant underwater colors. 1, Especially for GoPro, during a dive shooting for color correction. 2, suitable for tropical blue water and water. 4, between 3 metros 20 metros to use, 3 metros above have enough light red inside the water, do not use filters. 1, improves Underwater colors. Easy to install and remove. 2, built using the optically correct acrylic hard. 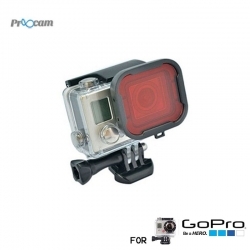 3, can be installed directly, only applies for GoPro Hero3 + standard hull and scuba diving Shell. 4, when taking in the tropical / Blue Underwater, you can correct the white balance, effectively improve the quality of shooting.